What is better then chevron paper designs? Chevron paper designs with GLITTER on them!! We hope you find inspiration to create with Doodlebug's Sugar Coated Chevron Cardstock. Hello there! 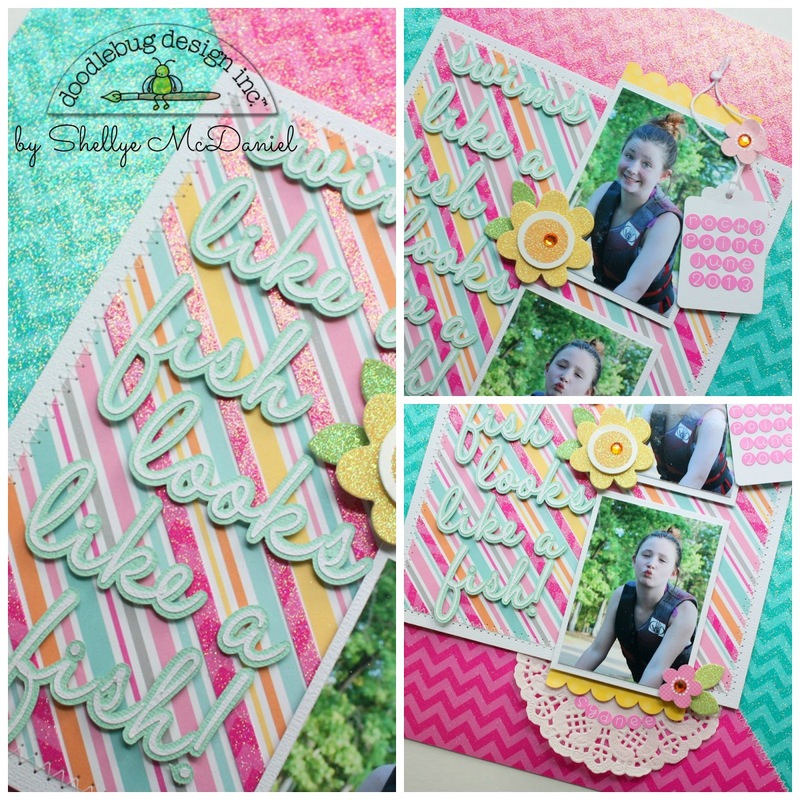 Shellye here to share a layout created with the amazing Chevron Sugar Coated Cardstock. As you can see, I started out with the Swimming Pool and Bubblegum shades. I cut the Bubblegum sheet into triangled pieces (there will be a total of four) and then layered two of the pieces on top of the Swimming Pool paper and machine stitched in place. Next, I cut a mat to measure 7.75" X 7.75" from Lily White cardstock and then topped it with a 7.5" X 7.5" square of diagonal striped paper from the Sugar Shoppe Collection. I wanted to highlight the darker pink stripes found in the paper, so I cut strips from the leftover Bubblegum Chevron and glued them in place. Before adding to the layout, I machine stitched the two pieces of paper together around the edge. For the title I took to my electronic die-cutting machine. I used Halo Handletter font and cut from Lily White Cardstock with a shadow of Pistachio Cardstock. I embellished with piece of a doily and various cardstock stickers and Doodle Pop. I love the illusion made by adding the square mat to the center of the triangular design; it's made even more eye-catching with the use of the Sugar Coated Chevron! Thank you for joining us today at Doodlebug Design! Hey crafty friends!! Candace from Scrappin' 2 Little Princesses here today sharing a layout using Doodlebug's awesome chevron sugared cardstock. This cardstock is AMAZING!! Since it comes in all the great Doodlebug colors you can find a chevron to match any project you are working on! 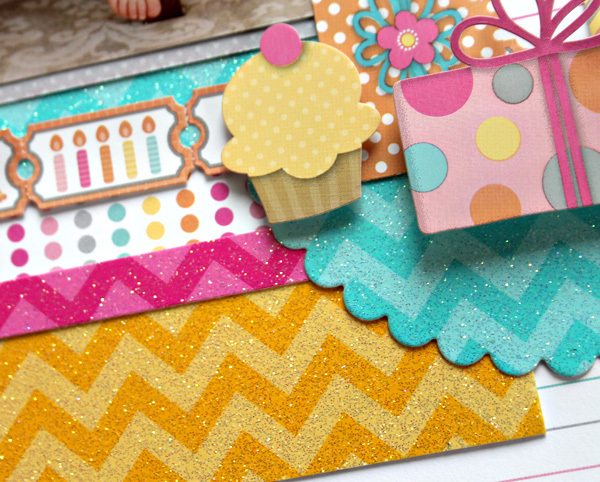 I am so in love with the Sugar Shoppe collection that I just had to use it along with matching chevron cardstock. I am so in love with the pattern, texture and sparkle of this paper! I wanted to keep my layout very simple since the chevron is so great on its own. So YUMMY, right?! It is the most beautiful, glittery paper I have ever seen (told you I was in love!). I used some foam stickers on the back of my 'Birthday' stickers to make them stand out. I love how the grey title looked over the aqua chevron. 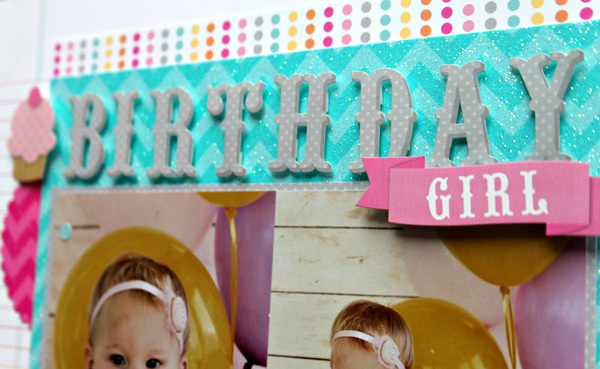 I love that this cardstock can be incorporated into every single project! Make sure you take a peek at all the great colors it comes in. 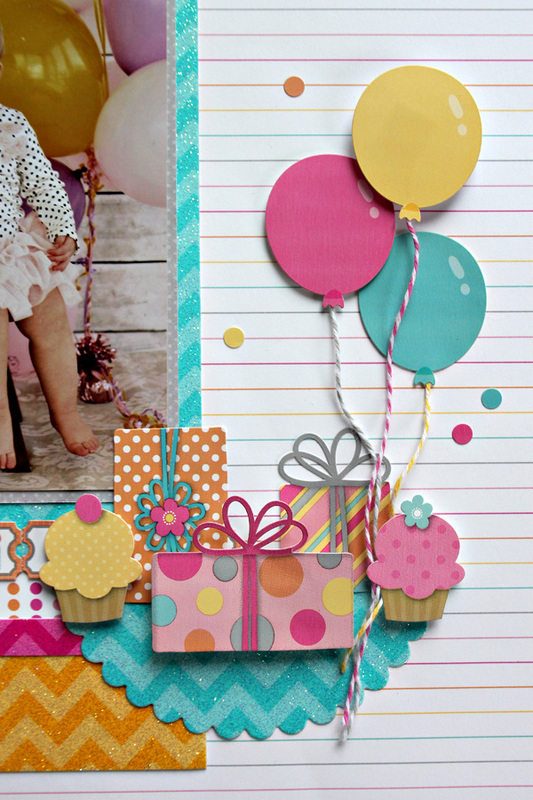 Enjoy all the inspiration and great ideas the Doodlebug ladies have for you using this yummy cardstock! Really wonderful layouts I like both and they are so creative. The adorable Birthday Girl is too cute. Beautiful layouts Shellye & Candace!!! Love this glitter paper and all the fun projects! Shellye and Candace did a fabulous job on these layouts - each one uses the sparkly Chevron paper to great advantage!! On each separate page it makes such a huge difference to them!! Thanks girls for sharing and giving me more Doodlebug cuteness to pin!! LOVE your sparkling triangle chevron background and double-layered title Shellye!!! 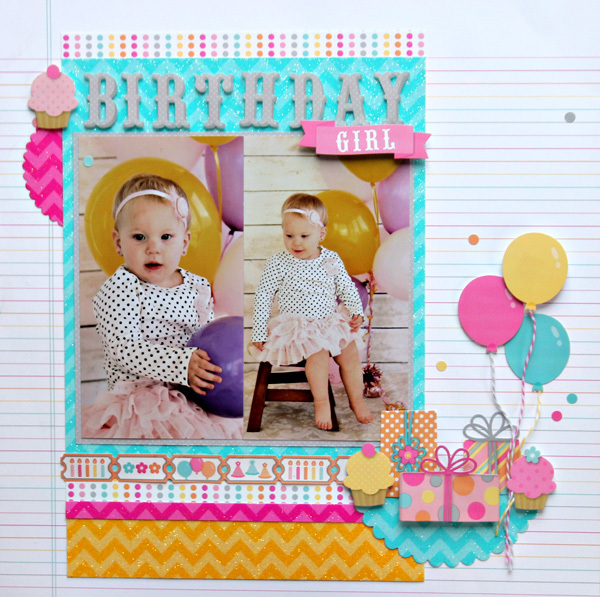 LOVE your combo of dots with the sparkling chevron, a FUN page that brings out the cuteness of the photo!!! I've pinned some pics to inspire!!! The 1st layout looks really cool with the 2 color triangle background & in the 2nd layout, I love the embellie cluster with the balloons coming out. Adorable layouts, nice pictures on both! 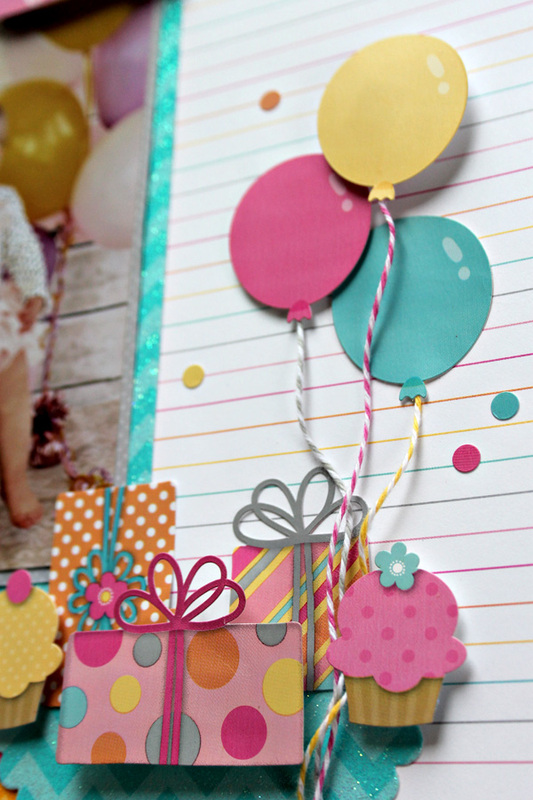 The chevron sugar coated cardstock is great to create nice in cute embellishments!